Ready to take the ultimate journey of discovery? 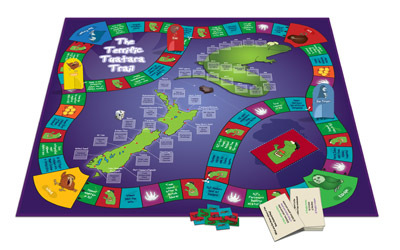 Travel through time and rediscover New Zealand’s rich historical past. 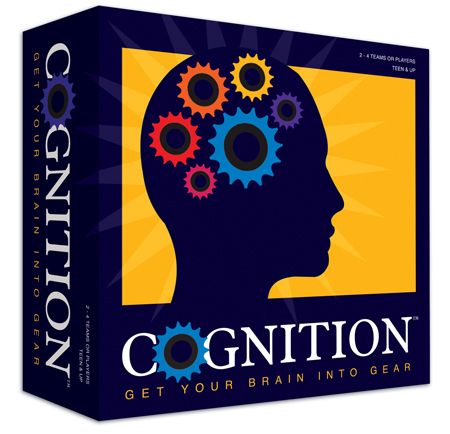 Answer questions as you go, and earn points by collecting worms, wetas, millipedes and beetles. 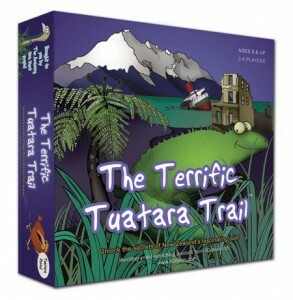 The player with the largest collection of delicious tuatara treats at the end of the journey wins the game! More gorgeous illustration by Bek sets this in the “Moa Hunt” family, but it expands on geography to add general and historical knowledge. We had a fair amount of input in terms of refining the game-play, and Bek worked hard to create a game board that would support the broader range of interaction. I’m quite proud of the way you collect and build your tuataras; it was an idea I fought for and it’s been very popular with kids.